As my teenage daughter gets older it is important to me that my husband and I spend dedicated one on one time with her. I want my husband to show her how a young man should treat her on a date. And I want to show her how to have age-appropriate fun with her friends. So, we took a trip across the river for a girls night out on the town in Cincinnati. For our girls night out, I told Olivia to dress nicely – in a dress or skirt and top – but gave her no other instructions. She has enough clothes that fit well and make her feel comfortable that I knew she would make a good choice. I want my girls to learn that when they look good they feel good, but I don’t want to them to be caught up in their appearance. We are just entering the makeup age. Lip gloss and eyeshadow are allowable in moderation. I’m not ready for black lips or green eyeshadow, yet. I’m also not ready for how grown up she has been looking lately. Before we cross the bridge into downtown Cincinnati, we stopped at the Newport, Kentucky Kroger Marketplace for dinner. They have newly remodeled the deli and offer a variety of options and a sit-down dining experience. The new Chicken Co meal options include individual $5 meal deal boxes or family style meals, complete with fresh biscuits and side items. 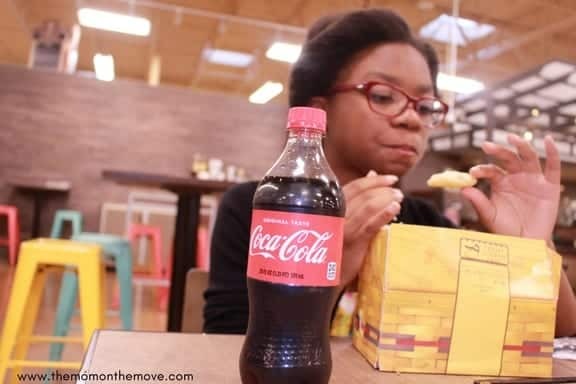 Complete your meal with a Coca-Cola® drink from the case right outside the deli and enjoy a quick, delicious dinner that won’t break the bank. I want her to learn that good doesn’t mean expensive. Also, if your friends or your date run out of money you can handle $5. Obviously, we drove into downtown Cincinnati. But once there, we street parked the car using the Cincy EZ Park app. You just download the app to your phone and pay for metered parking using your debit or credit card. It’s much more cost-effective than parking in a lot at event parking rates. Taking the Cincinnati Bell Connector is also a great way to get around. For no more than $2 per person, you can ride the 3.6 mile route around the busiest sections of the downtown corridor. We rode down to our destination for the evening. I want her to learn how to navigate public transportation and not to feel uncomfortable or out of place if she’s not driven to the door. Growing up in Cincinnati, I always wanted to hang out downtown after big events, and festivals. So I considered taking her to the Fountain Feud Game at Fountain Square. It’s a live version of the popular TV family game and it’s completely free. Check out all the events presented at Fountain Square on www.myfountainsquare.com. Instead, I searched a few local coupon sites and found discounted tickets to the Broadway show playing at The Aronoff Center. As a budding triple-threat Broadway Diva, I knew she would enjoy that experience. I want to her to learn to embrace who she is and invest in what makes her happy. She was absolutely thrilled. We were able to get our tickets for 25% off and had great seats by going on a less popular night. For even cheaper tickets you can take your chances with the Broadway Across America lottery. And even if you don’t get into the lottery, you can still purchase your tickets onsite, online or through a coupon site for the same evening when seats are still available. We had an awesome night on the town, and I am excited to continue nurturing the seeds I’ve planted with my teenage daughter. What life lessons will you teach your teenager from a night out on the town? The downtown area looks exciting. It looks like you all had a blast together. I have never been to Cincinnati. I love that in one night you taught her so many things. Navigating the train, dressing up for night on the town, and eating on a budget. I like the fact that you all take her out separately to show her different things. I love the idea of girls night out with your daughter. Now that mine is older we do this sort of thing a lot. It usually involves shopping though. I love Cincinnati!!! How fun, we are always coming that way since its only 4 hours away…I’m going to have to check some of these sites out next time we come to Cincinnati! I wish my mom and I shared moments like this. My daughter is only 5 and we started Mommy/Daughter Days. I look forward to continuing them as she gets older. I love this idea. I would love to do more outings with my mom. It is important to have a good mother/daughter relationship growing up. It’s cool that you’re showing her that you don’t have to spend a lot of money to have a nice night out too. Great tips and we are starting the individualized one-to-one time with kids as well. I think this is so important in their development and in strengthening the ties between parent and child. Thank you! I love this idea and yes–your daughter looks so lovely! It sounds like you had an amazing time!